The University of Georgia leads the charge in dynamic STEM education through a novel program of graduate study. 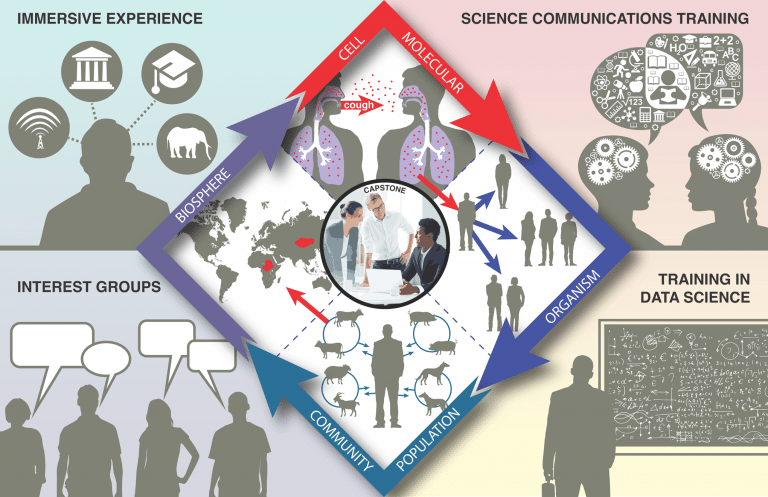 Interdisciplinary Disease Ecology Across Scales (IDEAS) is a National Science Foundation supported Research Traineeship Program that trains PhD students in new ways to solve infectious disease problems occurring across different scale of biological organization. This program integrates various biological disciplines as related to infectious disease and includes quantitative training, science communication, and professional development. Graduates can expect to move fluidly and confidently throughout the academic and professional sectors. Our curriculum is oriented at effectively addressing the challenges related to infectious disease dynamics in changing environments. Over the last few decades, major technological advances in areas such as molecular biology and computer science have created unprecedented opportunities for biologists to understand the inner workings of the smallest life forms on earth and simultaneously to investigate biological processes on global scales. A major challenge to educating biologists in the modern era is providing them with tools to move flexibly among these massively different scales of organization. An area of the biological sciences where such a cross-scale approach is particularly relevant is the study of infectious diseases, where, for instance, details of host-pathogen interactions occurring within a host at the level of the cell can contribute to the emergence of globally pandemic infections. To respond to the need for a scientific workforce that can address current and future challenges related to infectious diseases in the environment, the IDEAS program at the University of Georgia trains students in new ways to solve infectious disease problems occurring at the interface of different biological scales of organization. To do this, IDEAS combines innovative cross-scale biology education with advanced skill development in computer modeling and practical immersion in global infectious disease issues. IDEAS devised a PhD curriculum comprised of the four essential objectives for scientific research. These learning objectives are achieved through a unique blend of interdisciplinary curricular elements, participation in professional development activities, and through independent and collaborative research. The University of Georgia is the ideal setting for transformative graduate training in infectious disease ecology. UGA has over 100 faculty working in the area of infectious diseases. These faculty, representing eight different schools and colleges, are members of a cross-campus umbrella group, the Faculty of Infectious Diseases, which promotes interdisciplinary and integrative disease research across campus. and the Fogarty International Training Grant on Computation and Bioinformatics. We are committed to capitalizing on the partnerships between our program and others to engage students from other disciplines in the training of new curricular and professional development activities provided through IDEAS.